Mirror booths usually do not display the camera’s live view because guests see themselves pose in the mirror. To capture still photos without displaying the live view simply switch it off in Advanced Settings. This is great when you want to make slideshow GIFs from a set of still photos. Breeze boomerang GIFs are captured from the camera’s live view, so when live view is switched off you cannot shoot boomerang GIFs. Guests will still see the countdown but not the live view. Magic! This Windows based App runs as a fully functional trial for up to 14 days supporting most Canon DSLR cameras and Canon’s mirrorless M50. Breeze Flipbook Photobooth is Windows based event software for creating flip books using a Canon DSLR camera. Guests capture a short animation and play it back by flicking through the pages of a printed flip book. Most the equipment is the same as you need for a DSLR based photo booth. Books are usually printed on a dye sublimation printer capable of printing 6×2 strips. Breeze flexibility as standard! Offer guests a choice of green screen backgrounds or book covers. Add an extra dimension by changing the background or overlay as the book progresses. Upsell larger books or more pages. Use multiple printers at large corporate events. Breeze Flipbook Photobooth supports dye sub media, laser and inkjet printers. Nick runs events and sells photo booth/flip book station packages using Breeze event software. Flipbook photobooth 1.8 comes with two scripts which create flip books when guests make boomerang GIFs in DSLR Remote Pro. One script creates a flip book for every boomerang GIF, the other asks the guest whether to print the flip book. Note: These scripts use the free Windows scripting tool, AutoHotKey. You need to download and install AutoHotKey before you run them. auto_print.ahk (2) prints the flip book automatically when the animated GIF is accepted in DSLR Remote Pro. auto_print_with_prompt.ahk (3) ask the guests whether to print the flip book. Breeze also provide a free script which creates a GIF animation of each flip book sequence. This script uses the free Windows scripting tool, AutoHotKey and the ImageMagick convert command line tool. AutoHotKey must be downloaded and installed before you run the script. Double click on flipbook2GIF.ahk to run the script. Open the script in a text editor such as Notepad for detailed instructions. Please note that this script is provided free of charge and comes without any warranty or support. Download Flipbook Photobooth 1.8 and try it for yourself for up to 14 days before buying a license. Note: Breeze DSLR Remote Pro, Breeze DSLR Remote Pro Multi-Camera and Breeze Kiosk need to be purchased separately. Breeze Systems are not responsible for the content of external sites. This post explains how to add animated overlays and titles to boomerang (aka ‘burst’) GIFs using DSLR Remote Pro 3.12. How to create slideshow GIFS with animated overlays. 2. Next click on File (A) then Videobooth Settings (B) to show the Videobooth Settings screen. 3. The settings below create a ‘boomerang’ animated GIF from the whole photo (landscape orientation) without any border. This GIF will be 600 wide x 400 pixels high. When you have chosen the settings you need click OK (here and the other pop up windows until you return to the main screen). 4. You need the same number of overlay images as frames in the boomerang GIF. In this example the animated GIF has 29 frames (separate images) created from 15 original images*. You need 29 overlay images; called video_stills_overlay_1.png, video_stills_overlay_2.png …. video_stills_overlay_29.png . *If you don’t use a title, there are 28 frames so you only need 28 overlays. You can download the snowflake overlays here . Copy all 29 images into the folder you are using for the photobooth screens. Note: Boomerang GIFs need one extra overlay if they have a title. For a single title create a title image named video_stills_title.jpg and insert this into the same PhotoBoothImages folder. Run the photobooth and boomerang GIFs created by guests will have animated overlays. Download DSLR Remote Pro and try this yourself. This example uses DSLR Remote Pro’s simulated camera; a handy feature which lets you try out features and set up designs without connecting a real camera to the computer. The GIF has an animated overlay of falling snow and a title. It has been captured in black & white. The falling snow effect here uses 29 images to create the animation. The snow flakes are in a different position on each image. You are welcome to use these snowflake overlays in your own booth with DSLR Remote Pro. If you found this post useful please share it with others. DSLR Remote Pro 3.12 is a free upgrade for all registered users who purchased a license on or after 26th November 2017. You can make two kinds of animated GIFs using DSLR Remote Pro 3.8 and Webcam Photobooth 2.4 : slideshow and boomerang. Slideshow GIFs contain still photos taken during normal photobooth operation. You can set up your booth to print the strips (or other layout) and share the same photos in an animated GIF – which looks much more interesting than viewing a strip on a phone. Boomerang aka Burst GIFs are captured with a short video clip. Both types of GIF can be shared via MMS/SMS, emailed and uploaded to social media. This blog post explains how to create slideshow GIFs with animated overlays using the Photo Booth Setup Wizard in DSLR Remote Pro 3.8. Photos are printed in the usual way; guests can share the same images as an animated GIF. You can customize your GIFs using the advanced settings. 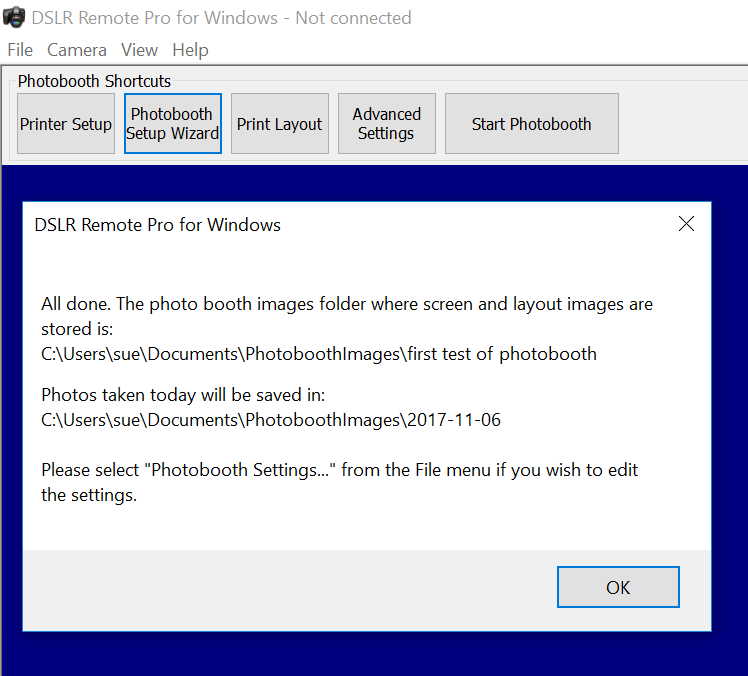 Start DSLR Remote Pro and run the Photobooth Setup Wizard. This example uses a strip of 4 photos. Choose whether to share via Twitter, MMS/SMS or email at Step 3. (Leave these boxes unchecked if you are using a separate sharing station.) This example creates a 4 photo strip; guests can share their GIFs using MMS/SMS. 6. A photo width of 600 pixels is a good start point. Use the settings in the image above to create an animated GIF from the whole photo (landscape orientation) without any border. Check the final box if you want to make an MP4 copy of each GIF. 7. When you have chosen the settings you need click OK (here and the other pop up windows until you return to the main screen). You can create an animated overlay from a set of transparent png images. The falling snow effect here uses 12 images to create the animation. The snow flakes are in a different position on each image. (3 snowflake overlays are shown over each of the 4 photos.) You can download the snowflake overlays here . Change the number of overlays per photo to 3 and click OK (here and the other pop up windows until you return to the main screen). Now copy the overlay images you downloaded into the PhotoBoothImages folder containing your screens (A). The overlays must be named GIF_overlay_1.png through to GIF_overlay_12.png (B). Learn how to create animated GIFs with a border and/or title. Create boomerang GIFs with an animated overlay. If you found this post useful please share it with others. You are welcome to use these snowflake overlays in your own booth with DSLR Remote Pro. Breeze Systems is proud to announce the release of DSLR Remote Pro 3.8. Easier to use and more powerful than ever before, DSLR Remote Pro 3.8 includes two free button sets designed by Wilkes Booth Co.
B. Create your own buttons or choose from those shipped with DSLR Remote Pro 3.8. Touchscreen buttons can be placed below the image or to one side using the Setup Wizard. C. Customize captions in almost any language. Adjust the color of your text. To generate themed screens on PCs with different screen size/aspect ratio by just copy the theme to the new PC and run the Photobooth Setup Wizard. 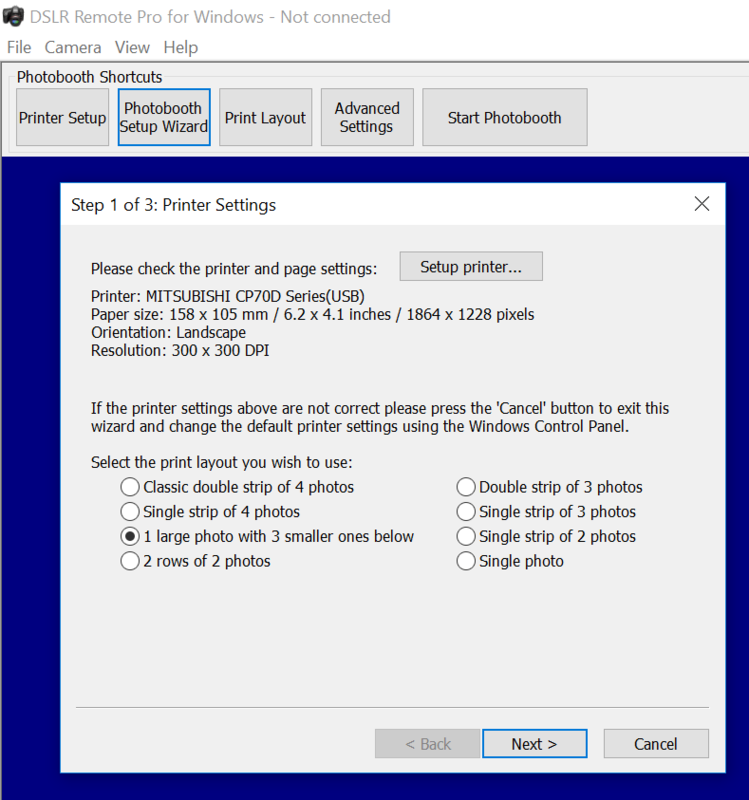 Choose whether to run buttons across the screen or to the side using the Photobooth Setup Wizard. 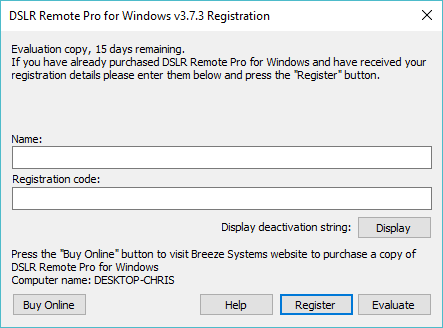 Breeze software is used in over 80 countries world wide. DSLR Remote Pro already supports Unicode and handles characters in most languages. Use the Photoboth Setup Wizard to create reusable caption sets, and apply them to different themes. DSLR Remote Pro 3.8 is shipped with English, German, Polish, Italian and Romanian captions. DSLR Remote Pro 3.8 is a free upgrade for all registered users who purchased a license on or after 29th November 2016. 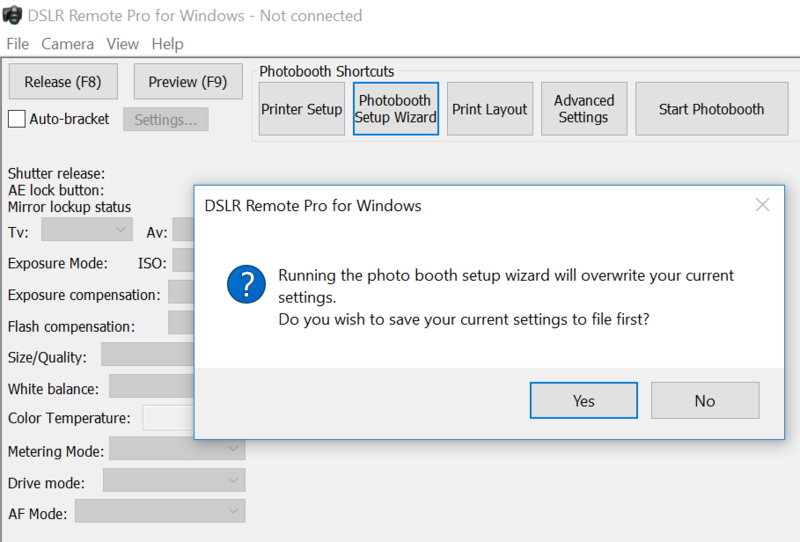 This is the first of a series of posts explaining how to setup your photo booth using the DSLR Remote Pro 3.7.3 Photobooth Setup Wizard. 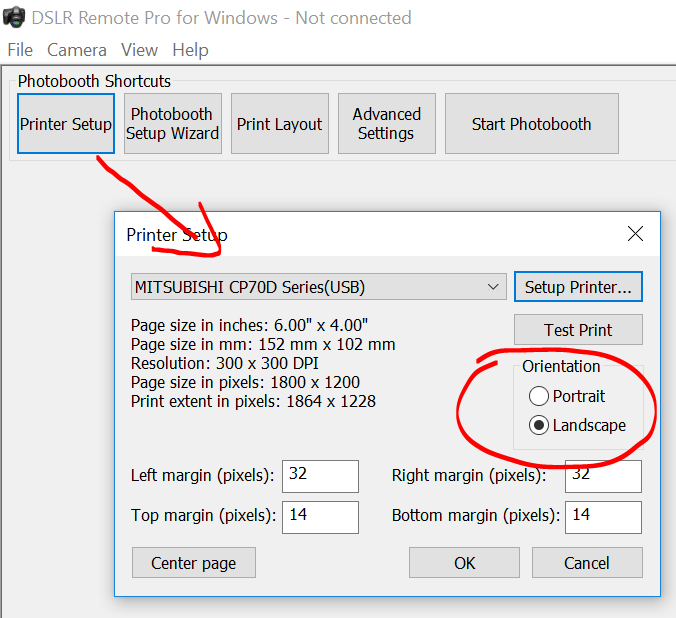 Getting Started with DSLR Remote Pro (2) will explain how to customize your prints. Getting Started with DSLR Remote Pro (3) will explain how to customize your screens. 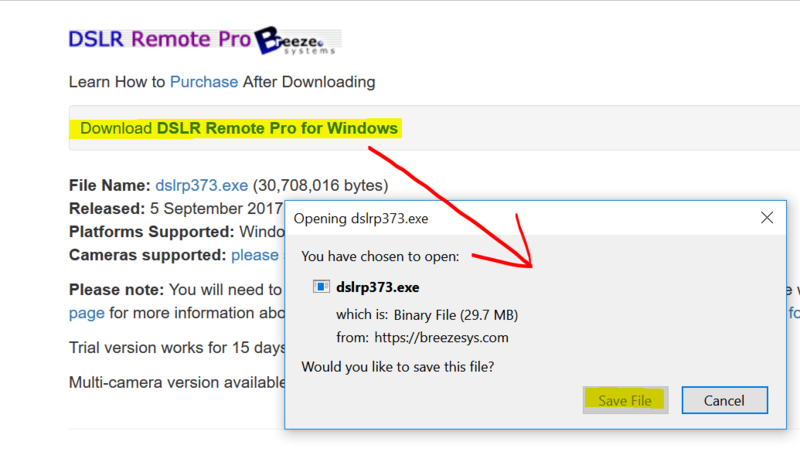 First download DSLR Remote Pro from our website; and install the program on your computer. You can run the program as a free trial for up to two weeks from the day you download it. Start the program. If you are running a trial version of the program you will see the registration window each time you start. Click on Evaluate. There are five buttons at the top of the main screen. They are shortcuts to the most used parts of the program. First connect your printer to the computer and switch it on. You can also connect and switch on your camera now; or use the ‘simulated camera’ at this stage. 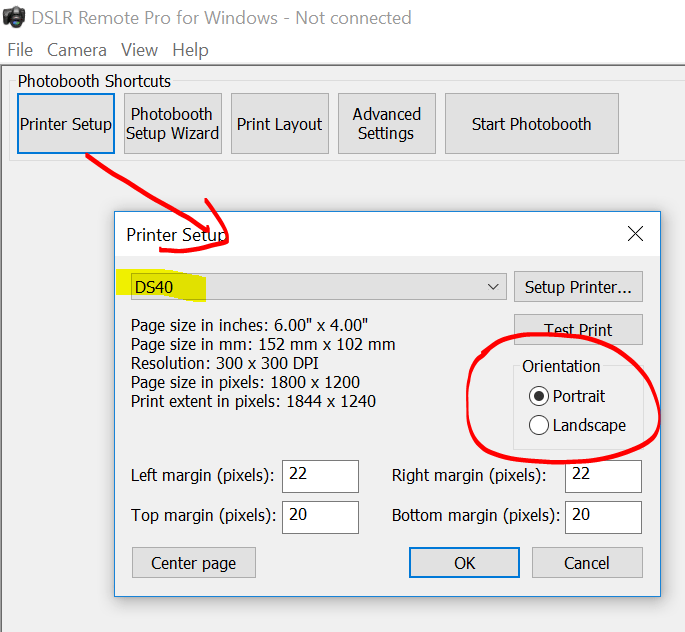 Select Printer Setup to tell DSLR Remote Pro about about the printer you intend to use. Choose prints in Portrait or Landscape orientation. Hint: Portrait is used for narrow strips of 3 or 4 photos, unless you have a DNP printer. Hint: For DNP printers using 6″ by 4″ media portrait and landscape orientation are swapped. Finish by clicking on OK.
At Step 1 you choose the photo layout you need. The wizard offers a choice of 8 popular layouts; if you want something different choose whichever is closest to your design (you will be able to change this later). Next Step 2. Tell the program which folder to save the photo booth photos you are going to shoot. Finally choose the options you want to offer your guests. 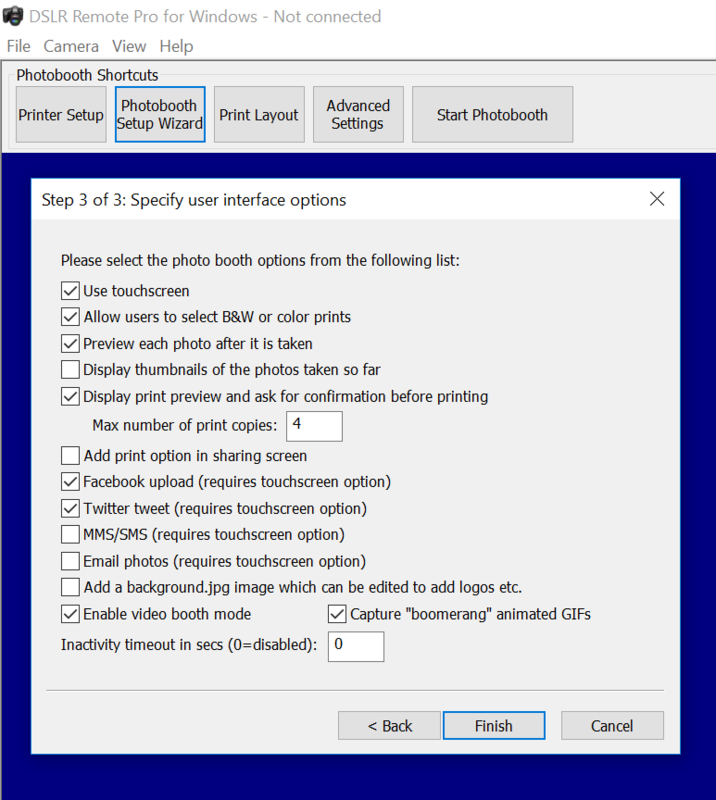 The first 5 check boxes tell the Wizard whether you are using a touchscreen, whether guests can choose between color and B&W prints, whether to display a preview of each photo after it is taken and the maximum number of prints allowed. The next five check boxes tell the wizard whether a sharing screen (after the photos are taken) should offer uploads to guest’s Facebook and/or Twitter account, share photos by email or MMS/SMS, or offer optional printing. Hint: some operators prefer to offer browsing and sharing from a kiosk separate to the booth. You can use Breeze Kiosk for this. To share and print photos away from the booth leave these boxes unchecked. Beginners should leave ‘Add a background.jpeg’ blank at this stage. Print layouts can be branded/customised later. To offer ‘boomerang’ animated GIFs check ‘Enable videobooth..’ and ‘Capture Boomerang GIFs..’. Click on <Finished> and you will see a final screen reminding you where the screen and print layouts created by the wizard have been stored; and where photos taken today will be stored. Close this window, connect your camera and switch it on before selecting ‘Start Photobooth’. That’s it! 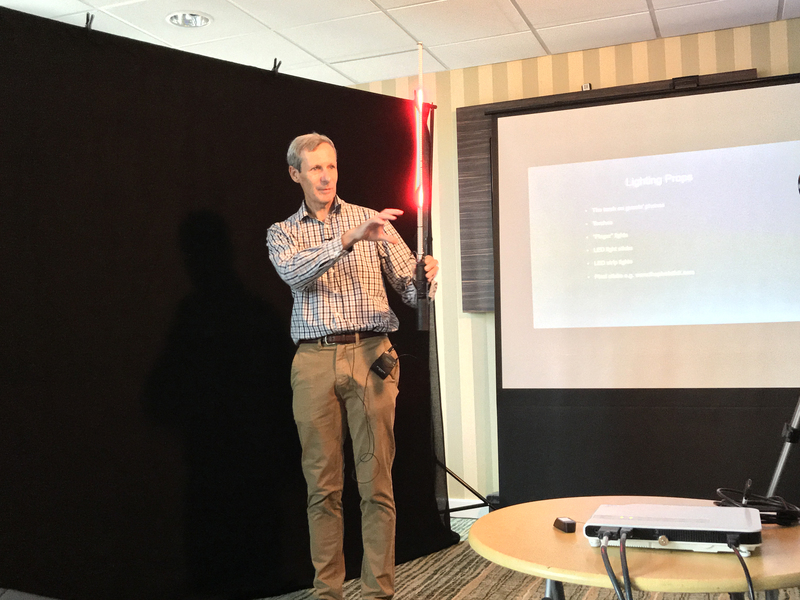 Thanks to all who came to the stand and listened to Chris’s presentation at the first UK Photo Booth Show. We had an amazing time catching up with old friends and making new ones. The Breeze stand focused on three industry trends: animated GIFs, 3D activations, and magic mirrors. DSLR Remote Pro appeared in multiple guises on several stands. It was beautifully complemented by a Wilkes booth and ran the magic mirrors on our own stand and at I Love Photobooth; partnered with Breeze Kiosk at Everybooth; and powered green screen software at Incredible Booth. Andrew Bliesner’s professionalism, knowledge of our software and willingness to share his experience and tips with visitors was fantastic. The screen and GIF designs were adapted from Breeze Themes at Wilkes Photobooth ‘The Lab’. Thanks Andrew and Steve! Activations creating 3D GIFs are are increasingly popular; and Breeze software is trusted by many industry leading operators to provide ‘bullet time’ animated GIFs. Multiple images are taken using DSLR Remote Pro Multi-Camera, automatically combined into an animated GIF, and shared using Breeze Kiosk. Hotfolder Prints was used to provide visitors with a printed takeaway. Thanks to Matt at Noonah for lending us the multi-camera rig in this video. You can buy your own multi-camera system powered by DSLR Remote Pro Multi-Camera from Noonah. I Love Photobooths kindly lent us the magic mirror running DSLR Remote Pro to show on the stand. Purchase the complete magic mirror from I Love Photobooths (their Green Screen Dream Machine and Hashtag Printers also run Breeze software). Interested in multi-camera activations? Download a copy of DSLR Remote Pro Multi-Camera and try it for yourself. Chris will also be giving a presentations about multi-camera systems at PBPI in January and PBX 2018 in March. A big thank you to Jon Sharp for organising the show. Do you want to offer your guests something new with very little effort? You can add animated GIFs to your booth with just one extra click using the Photo Booth Setup Wizard in DSLR Remote Pro. DSLR Remote Pro and Webcam Photobooth include two kinds of animated GIFs: boomerang and slideshow. Boomerang GIFs are captured with a short video clip, and usually shared using social media or by email. Slideshow GIFs contain still photos taken during normal photobooth operation. These GIFs can also be shared. The same photos can be printed in a strip or other layouts. This blog post explains how to create simple boomerang GIFs using the Photo Booth Setup Wizard in DSLR Remote Pro. Webcam Photobooth works in a very similar way. You can customize your GIFs using the advanced settings. You need DSLR Remote Pro 3.7, Webcam Photobooth 2.4 or a more recent release; a touchscreen, and your camera must support video. Customers with DSLR Remote Pro licenses issued before 22 February, 2016 also need to buy a DSLR Remote Pro upgrade license. Customers with Webcam Photobooth licenses issued before 17th May 2016 need to buy a Webcam Photobooth upgrade license. 1. Start DSLR Remote Pro. Select the Photobooth Setup Wizard. 2. At Step 3: Select the sharing and other options you need (B), then check the box to capture animated GIFs (C) . Choose any other options you need before clicking on <Finish> (D). 3. The next screen confirms that you have completed running the Setup Wizard. Close this to return to the main screen. 4. Connect your camera and switch it on before selecting ‘Start Photobooth’. That’s it! 5. 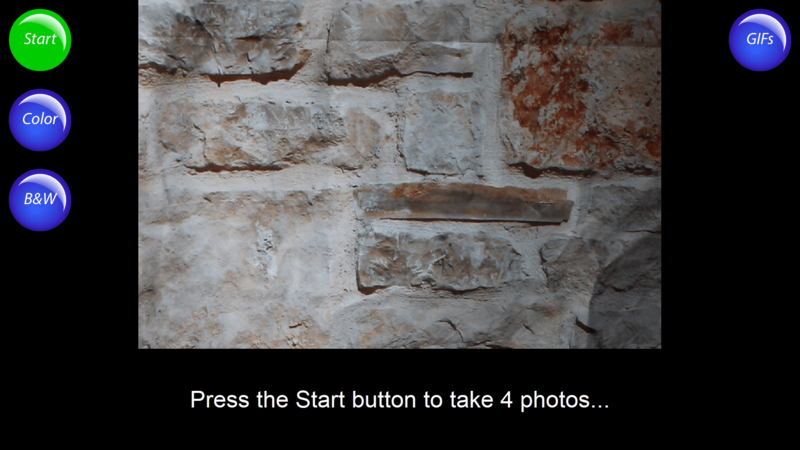 This is the default photo booth screen created by the Photo Booth Setup Wizard in DSLR Remote Pro 3.7.3 . Guests switch between boomerang GIFs and still photos using the button in the top right corner. 6. You can choose whether guests share GIFs directly from the booth as shown here, or take time to browse and share them away from the booth with Breeze Kiosk (purchased separately). 7. The dinosaur chase at the top of this page shows what you can achieve just using the photobooth setup wizard. You can modify the default settings to change the video length and playback speed; add overlays and a title page to brand GIFs for each event. This example shows the same GIF overlaid with a simple border. The capture rate and image interval have also been altered to give a smoother result. Find out how to customize your own Boomerang GIFs .